The need for Social media Managers in companies we are affiliated to and for our clients have necessitated this all-important training and we are set for 5 states. Like you already know Social media is a big sector and those that will profit from it must be trained, and equipped to use it to bring value to organisations and personal brands that need it to advance their cause. Value is what people would pay for. With that consciousness and the fact that organisations keep reaching out to us for Social Media Managers especially in Abuja, we decided to train 5 individuals across 5 cities . This course features modules that are practical, expository and intensive in a 3 days format. Participants are encouraged to get ready to embrace work. Payments are done to our company via Diamond Bank, Logos Audibles Enterprises, 0024473443 after which you are to SMS your Teller no., Name and Location to 08038994417. After this process, participants would be slated for the training in their location of choice. 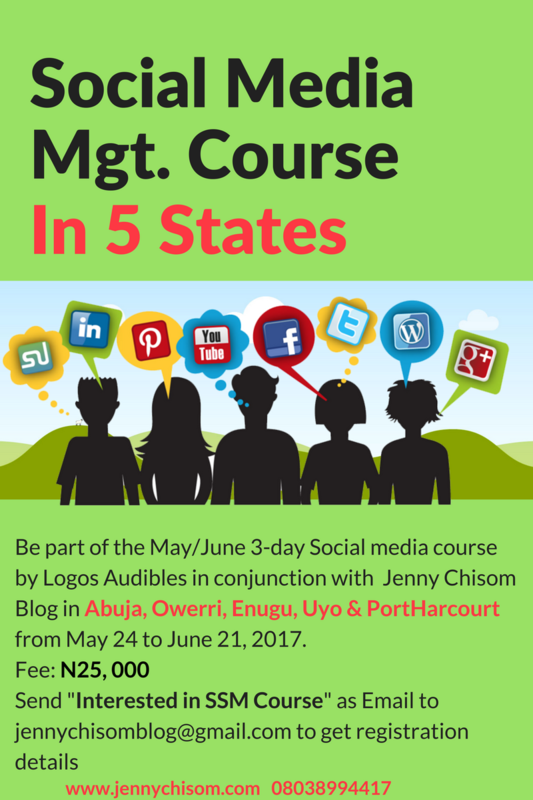 IMPORTANT:This course is a Bring-your-Device type and participants are to attend with a functional internet enabled laptop. NOTE: Venue for this training would be communicated to participants via SMS and Email as soon as they register.